I HAVE A NEPHEW! and boy is he cute! 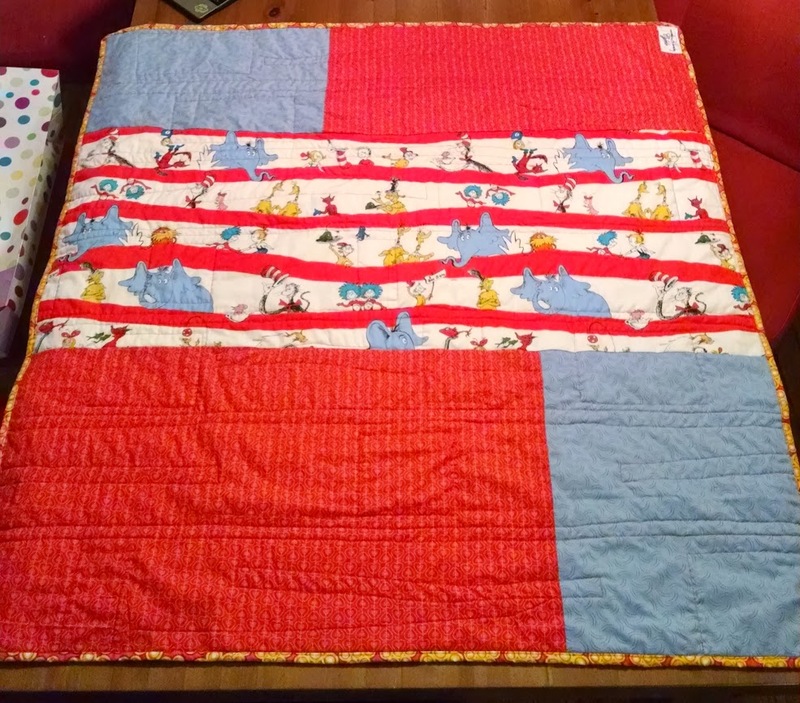 I made him this quilt for Christmas and sent it all the way to Spain with extra hugs and kisses. Farmers market, part… something, I have lost count. I think this was my 5th year at the farmers market? but maybe 6th? dunno. This year we had lovely weather and I made some super big pillows. And that little lady right there is my super big kindergartner. Time flies! 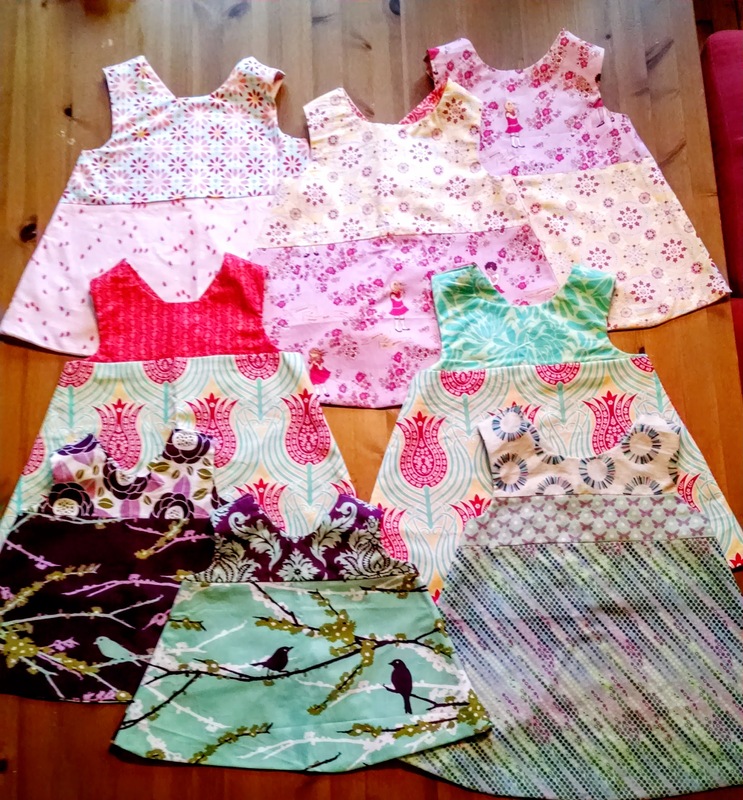 I made my normal assortment of dresses for little girls but I heard last year that all the babies who had my dresses were much bigger now and needed some big girl dresses. I kinda listened and made a variety of twirl skirts for the school aged set. 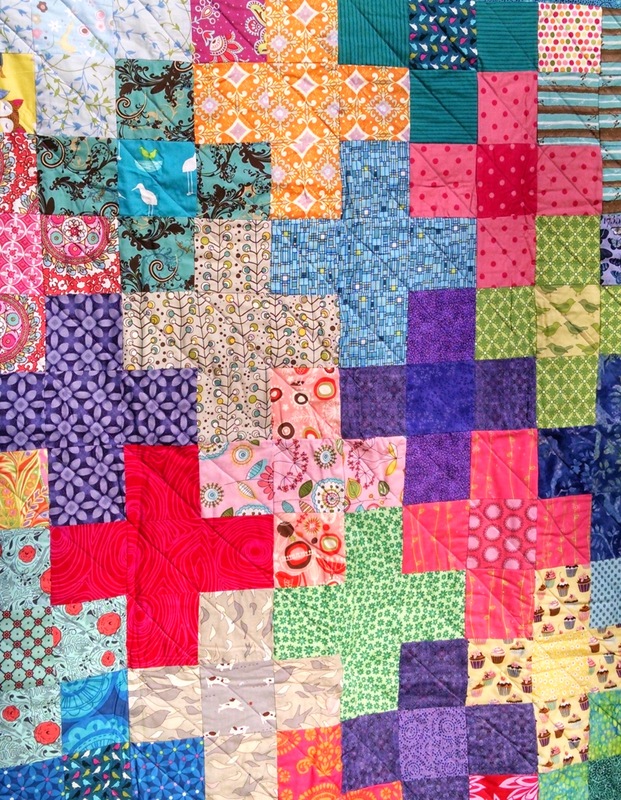 A baby quilt for a lovely baby born this summer to some of our favorite hippy-dippy friends. I love that polka dot fabric so much I wish I had bought more! 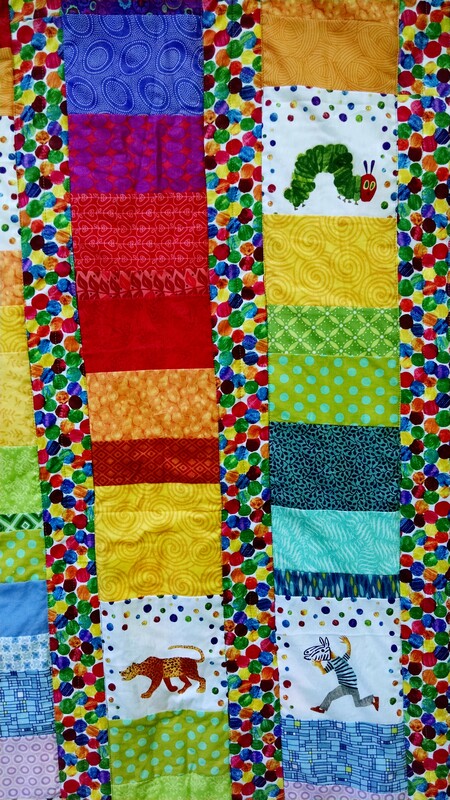 Mama loved the quilt and and I loved making the rainbow. When the winter days are short and we spend too much time inside I find myself with a need for more color. Matching is out the window, the more color the better. 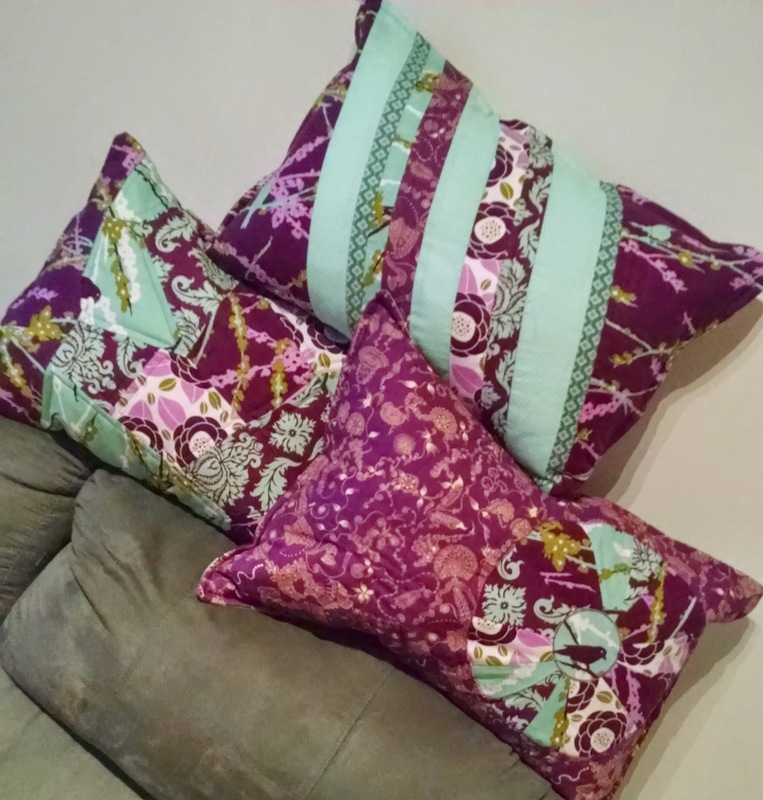 Jewel tone pillowcases to keep the winter blues away. 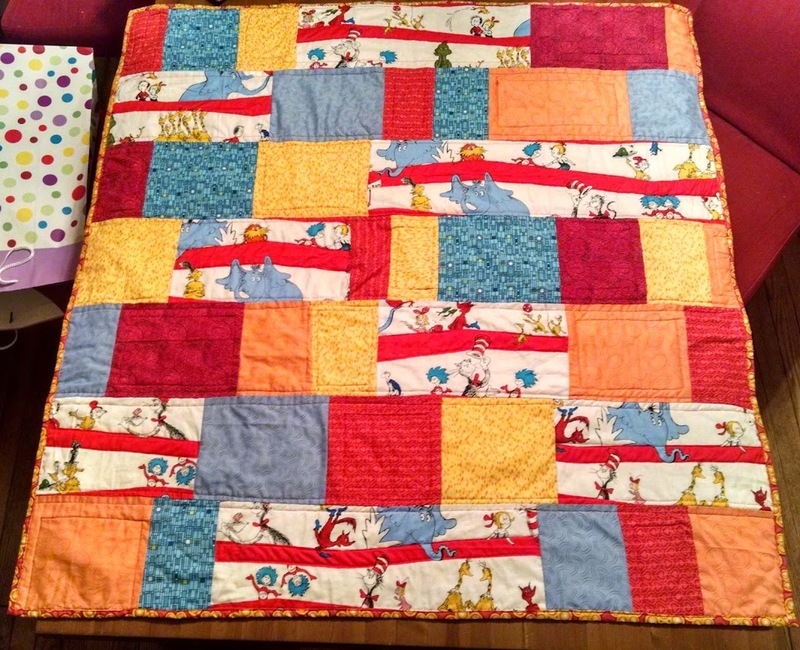 Made this just in time for a baby shower for a good friend with a Seuss themed nursery. Sometimes I find it hard to work with a print like this one. I tried to stick to some simple blender prints and I am thrilled with how it turned out. Not gender specific and bright and cheerful! I wish I had gotten better pictures but it was late the night before the shower. That is the gift bag there on the left that I crammed it into a few minutes later! … Maybe I will get one with the baby on it! 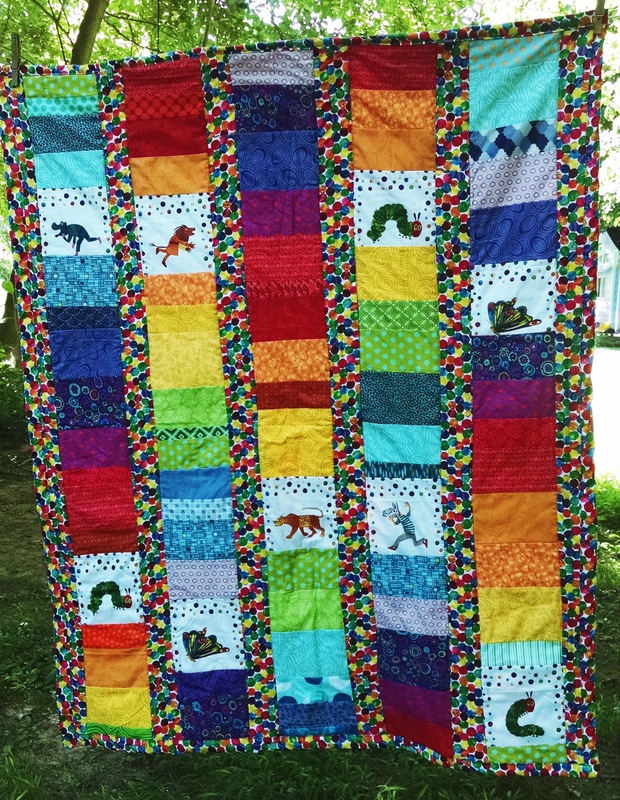 This was my March finish for a 4 month Work-In-Progress challenge at the local quilt shop. 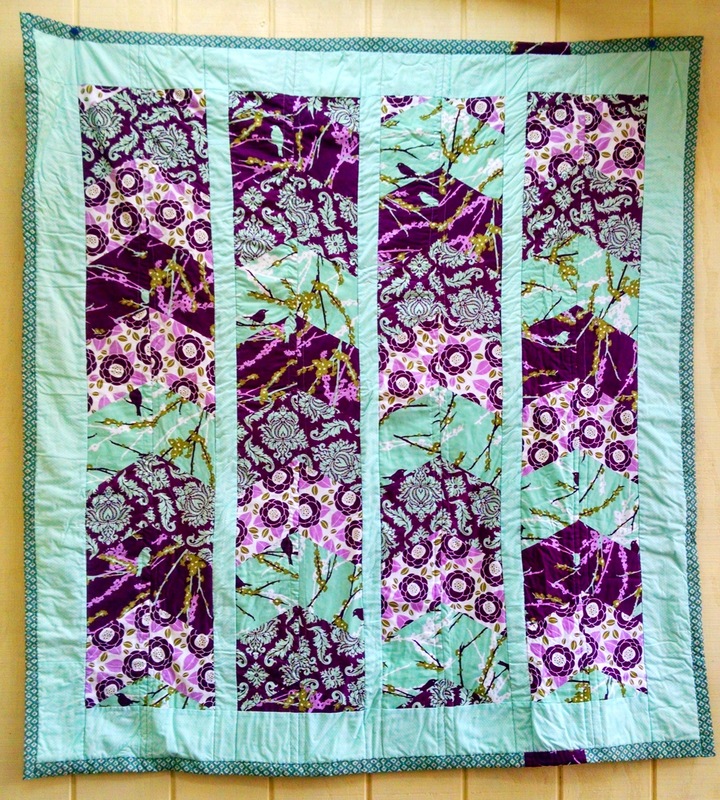 I started easy, the next 3 WIP’s are much larger so I will be back in a little while with a Kaleidoscope quilt. Chevrons. I am not thrilled with the flowers and how they look a little sloppy matching up but I love the colors. A nice variety of prints from Joel Dewberry with all the right tones. The backing fabric is from another designer and is a little darker in color. I love how it shows off that purple stripe. I keep thinking this will be a present for someone but somehow haven’t been able to let it leave my house. 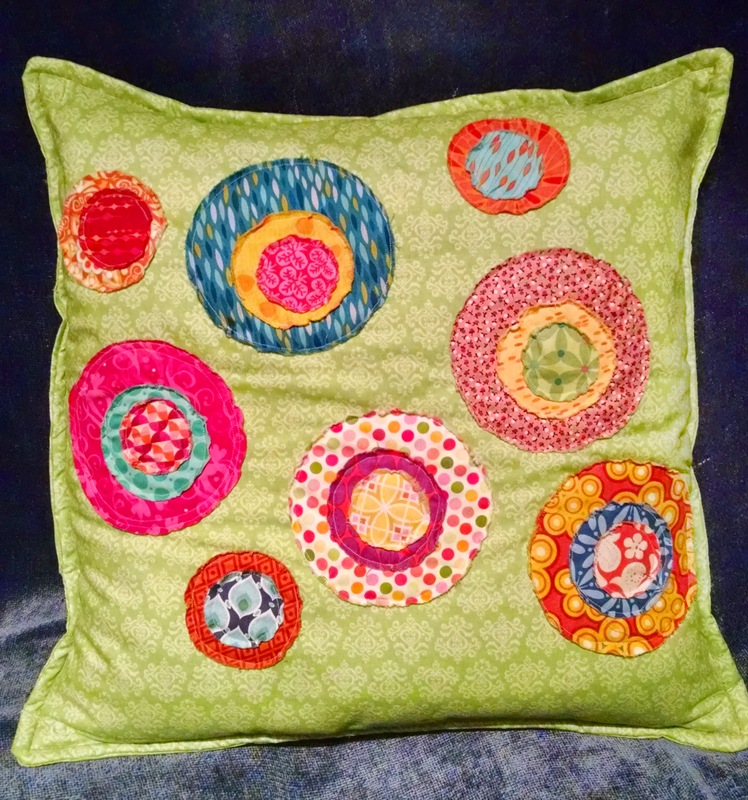 I love to make these pillows, quick, individual and who doesn’t need new pillows? I made a bunch for the last craft sale. It happened the ones I didn’t sell were the ones I loved the most and they now live on my couch. Kismet! 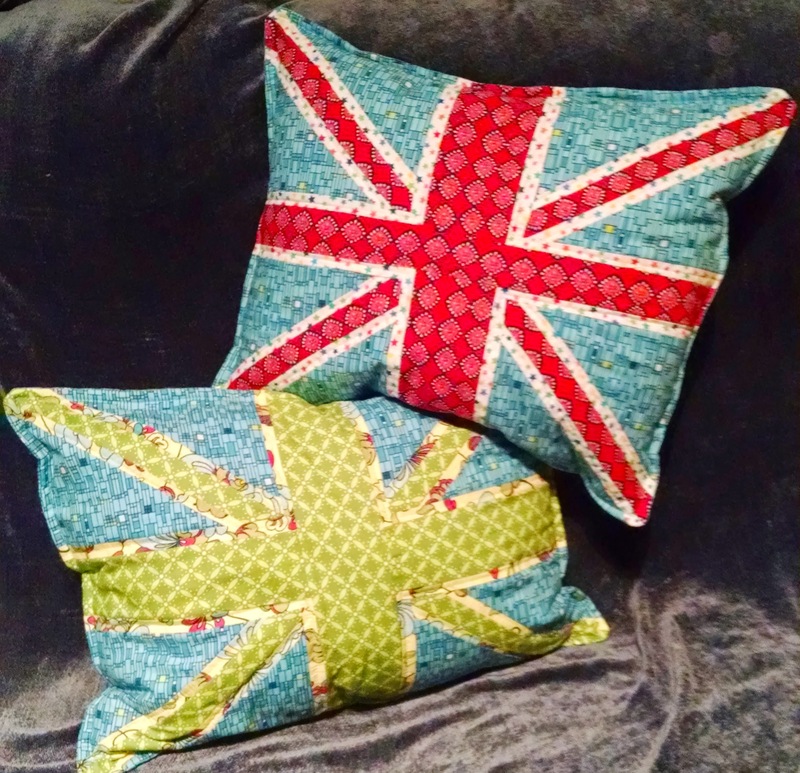 Watching Downton Abbey feels much better with a union jack companion. A throwback to some warmer days. When it edged above 30 degrees for days at a time. I pulled out some squares and made a good scrap buster in the fall. I am just waiting for a baby shower for a girl baby to gift this away. And I got to use this backing that I have been hanging on to forever. Love! I took a break from blogging. Inadvertently and unintentionally, but once I went silent, it was hard to talk about why. 2014 was a tough year. My Husband lost his aunt to cancer. Long standing marriages in my family started inexplicably crumbling causing trickle down anxieties and problems. Some of our life plans were delayed longer than we ever thought. In May I was terminated from my job and replaced by their just-graduated-from-college daughter. I am not proud to say, but it brought on a deep depression that some friends and acquaintances either didn’t see or didn’t understand. As one does in the hardest times, I learned who I can lean on. My husband has been my rock. I am still learning to adjust my life to surround myself with empathetic and responsive friends. In September I started a new job just a few miles from the house, with some lovely people, exactly in my field, and I know I am very, very lucky to have found something so fast. Yet, the black clouds lurked a little longer than I ever thought they could. This is not to beg sympathy from the anonymous world of blog readers, only to acknowledge the ups and downs of life. Most everyone understands having a bad week, month, year and more importantly trying to find a way to bounce back. And if you know me in real life, that little woe-is-me story prefaced my apology for the endless yammering I surely have done about this life transition. Sorry, thanks for bearing with me. I did a 2 day craft fair Thanksgiving weekend which was fairly successful. I did a lot of sewing beforehand and I will trickle these pictures out in the coming weeks. All the regular things for me. 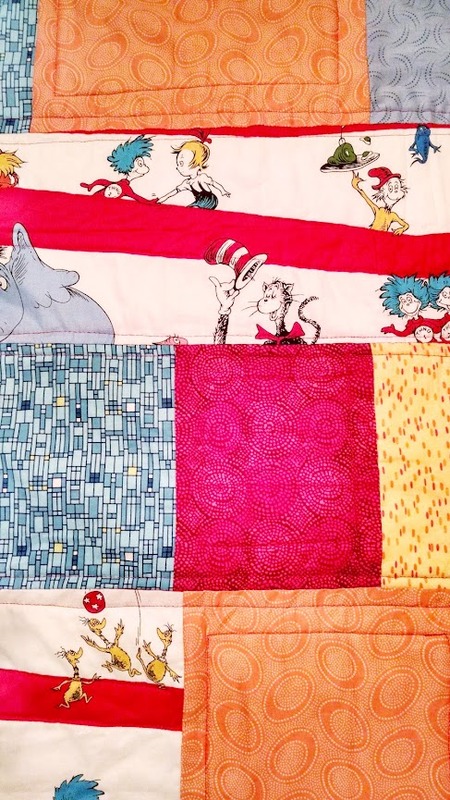 Baby quilts, Baby dresses, quilted pillows, and tooth fairy pillows. I did some aprons and drawstring backpacks too, which didn’t sell very well, but left me with some good Christmas presents to give. But the best part of this picture, for me, is my 4 year old shopkeeper, getting more clever everyday! I am by no means an expert, but I have a little experience doing a table at our neighborhood farmers market. I wanted some new ideas recently and couldn’t really find anyone sharing what they sell, so I thought I would share. Below are some pictures of the market yesterday. We had a little rain early on which forced me to pull everything way into the tent, but it cleared quickly and I sold about half of what I made. 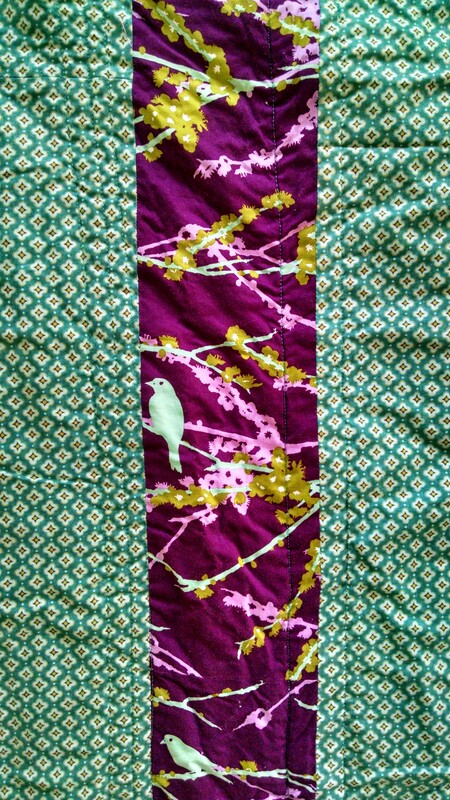 I have occasionally sold quilts at the market, not this time, but they do draw people in to talk to me. 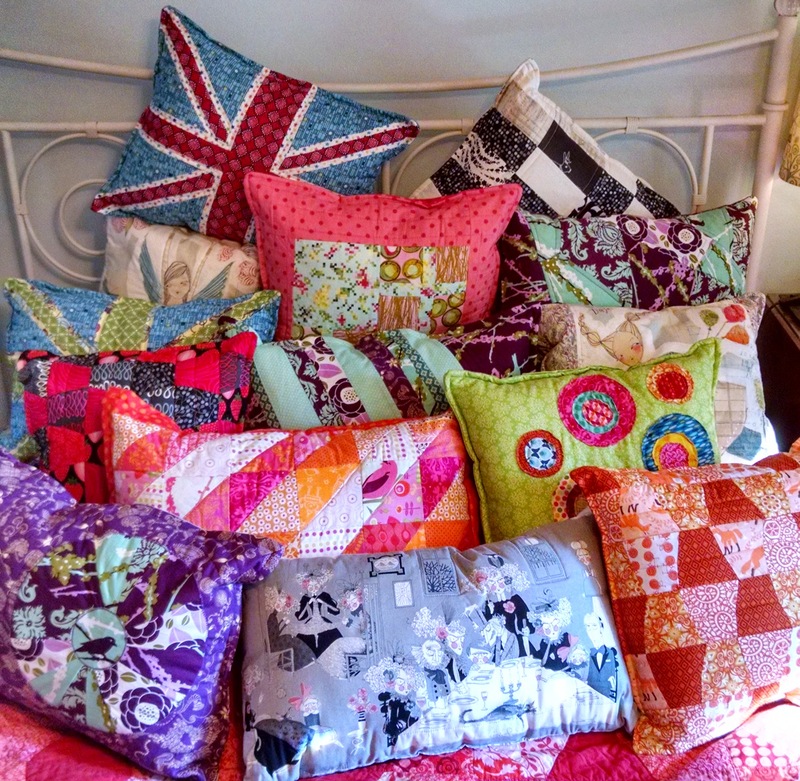 I made 10 patchwork pillows and sold 7. I used $4 pillow forms from IKEA and the covers were made almost entirely of scraps so they were definitely a profit item. I tried some ipad stands for the first time, I found a couple of tutorials on pinterest. I sold 4 out of the 10, but a lot of people commented how clever they were, I think they might to better at a show closer to Christmas. The biggest seller is always my dresses. Modeled here by my mini me. I have been making these dresses for about 8 years. They are reversible with no snaps, zippers, or buttons. I write more about them here and here. 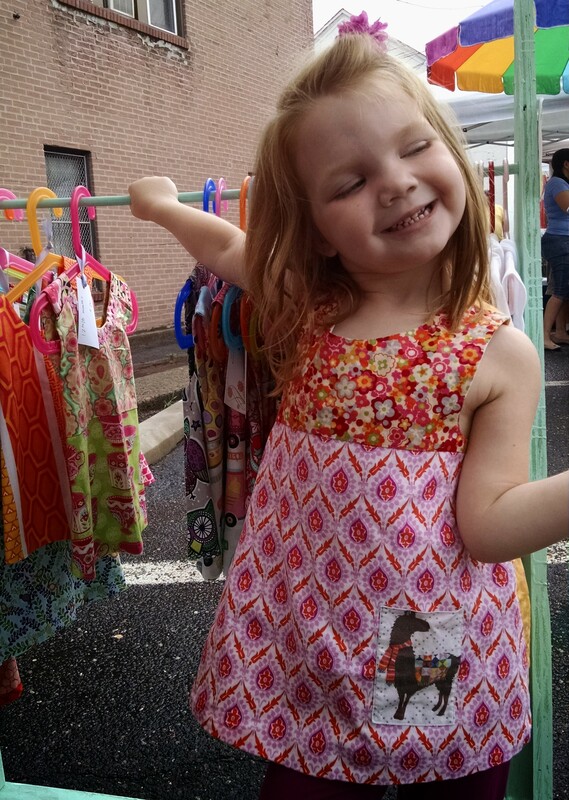 I sold around 20 dresses in 4 different sizes this time, which is about average for a 4 hour market. And the little things. I do some appliques on onesies and tee shirts if I have some good fabrics for it. I don’t really kill myself over these, but I do have a little stash of fussy cut pieces that would work and look at the clearance racks for white shirts. Dish soap dresses. More about them here. 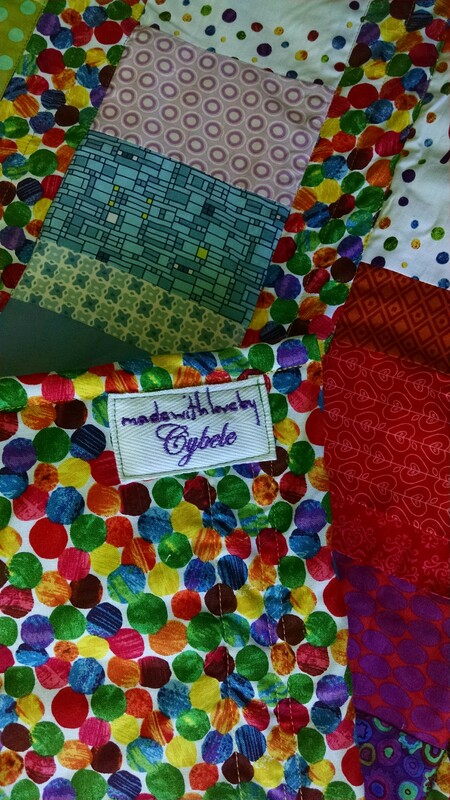 People giggle, but then they buy them and they are a great way to use larger scraps. The key is finding a lot of lace on a good deal. Bibs. I buy a 10 pack and sew on some fun appliques and people buy them like crazy. Maybe it is the low price item? Or because they are mostly gender neutral? Dunno. But they sell! Tooth Fairy Pillows. This is how I grab some of the parents that have kids too big for my dresses. I ask if the tooth fairy has visited yet and the kids get excited about the tooth fairy and the parents love the idea that the tooth doesn’t get lost! 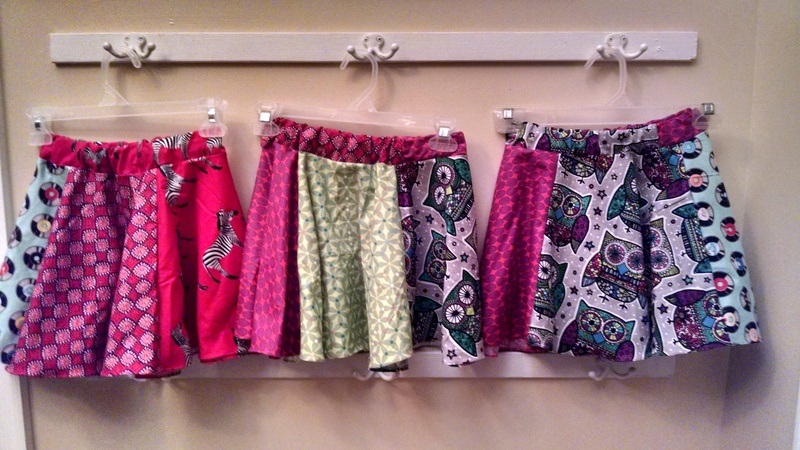 I have branched out in different fabrics since I first made them and make some with piping instead of lace for boys. I sold 6 of these in a few hours yesterday. Security Blankets. 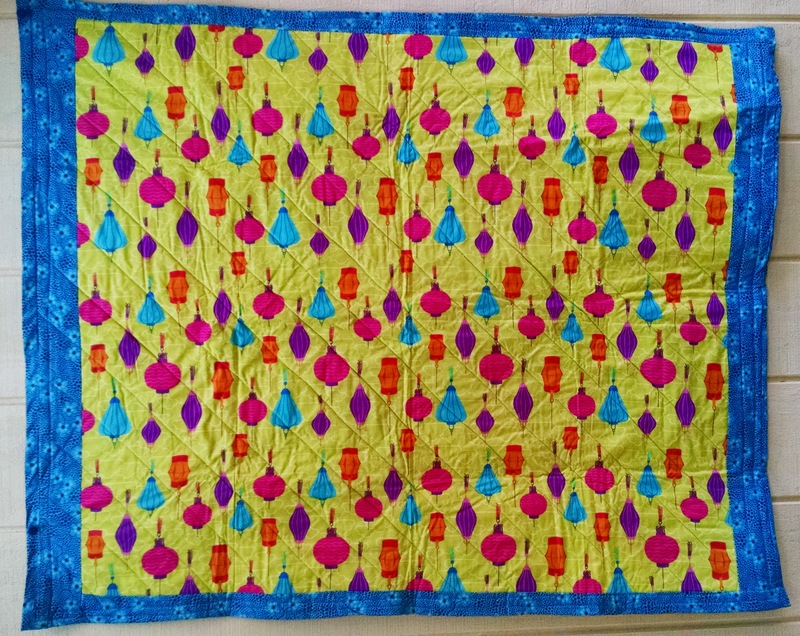 Another small item, but something that people love because they are hard to find in regular stores. I make them in matching pairs and urge people to buy 2 so they can have a backup or one at daycare. I would love suggestions of what else to sell and hope that these ideas help you!